My area of specialty is underwater and I also perform land searches. Search locations are most bodies of water (and land) that are located 4 hours from Toronto area. I will consider traveling further depending on the circumstances. Depends; typically there is a flat fee in addition to a ring finding fee; Note that I cannot guarantee ring finding, but I have been very successful to date, I have FOUND every ring that was lost! RENTAL AVAILABLE: my Fisher CZ21 underwater metal detector is available for RENT. It can be used on land & underwater. Rental rates: Daily $100, Weekend $150, Week $250 ; deposit required. My focus is searching for rings & metal items underwater on scuba; max depth is 60'. I can also search for non-metal items in deeper depths if large in size. I will also search on land for any item. I am very experienced scuba diver with over 20 years experience & 1000+ dives. I am also a technical diver & I teach. The underwater metal detector was purchased for a CBC/Outpost/Survivor man expedition in which we were looking for items lost in a river system during the fur trade. I have owned my metal detector since 2009 & am very comfortable using it. I was searching in a quarry on snorkel as I was not allowed to dive there on scuba. 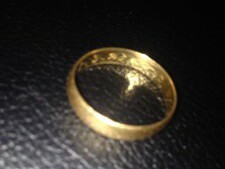 I found 2 pennies, 2 nails, 2 can pop tops & 1 ring. Paul Davies was used to answer my prayer. I had been doing the “spring cleanup” in my garden when I noticed that the most precious of all my earthly possessions, my deceased father’s gold wedding band, was no longer on my finger. This ring was a family heirloom, promised to my son as a memento of his grandfather’s love. I had searched the garden on my hands and knees, dug up the flower bed again and sifted through bags of yard waste, before giving up. My heart was deeply pained with the loss. I would have gladly given up (literally) anything I owned to see the ring on my finger again and to know that my son would wear it one day. Although I was almost without hope, I decided to search the internet for someone with a metal detector. I came across Mr. Davies and contacted him. He replied to me quickly and came to my property in Toronto to conduct the search. Within 10 minutes, the lost ring was back on my finger! I will be forever grateful.